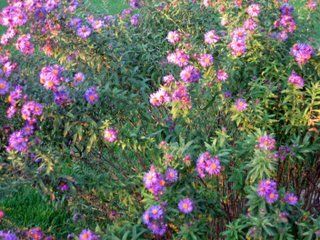 I could not figure out how my aunt got starts of these asters from my Dad, when I could not remember my Dad ever having these in our yard when I was growing up. I was bothered that I could not remember these because I think I was more aware of the plants around me at an earlier age than most, come to find out when I compare notes with others. And I certainly hope I would remember a flower like this that is blooming when not a lot of other flowers are. Further adding to the mystery, asters just did not seem like the kind of flowers my Dad would have. They are much too messy, floppy, gangly and a bit out of control for his taste. He generally liked his plants to be a bit more 'well-behaved', like nicely trimmed yews or a row of red geraniums safely contained in a long planter box on the front porch. Then I talked to my aunt this weekend and she gave me the real story and it is all no longer such a mystery. First, she didn't get the plants directly from my Dad. She got them from her mother (my Dad's mother-in-law) who got them from my Dad. That clears up some of the mystery, but how did he come to have them in the first place? That we won't ever know, but my aunt said he gave them to his mother-in-law because he didn't like the untidy, unruly nature of these flowers. I hope Dad provided a complete description for Grandma of what she was getting in the asters before he gave them to her. Normally passalong plants are shared plants that we love, that we want someone else to also enjoy, not "here take these, not my kind of flower". But, I guess there are exceptions, and I would prefer to think that he gave them to her because he thought she would enjoy them and not just because he wanted to get rid of them. Anyway, that's why I don't remember us having asters when I was growing up. Dad didn't keep them around long enough for me to notice them. I am guessing he got rid of them before I was five or so. Fortunately, I don't mind a plant that doesn't exactly play by the garden rules all the time, so I am happy to have them. In return for me putting up with all the misbehaving aspects of the aster, I get these lovely flowers blooming in late September, early October, when not much else is blooming. I think they are worth it, don't you? They are lovely, Carol - and now you can enjoy them with full knowledge of how they turned into one of your family's heirloom plants. Did your dad ever use the saying,"shape up or ship out"? Can you picture him saying that to your asters? 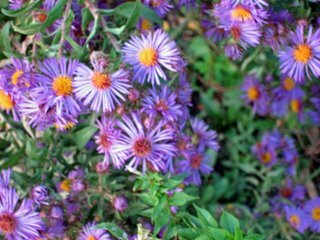 Although it doesn't always work, you could cut them back before the 4th of July - sometimes that makes asters regrow more densely and stand up better. I have some asters in bud, but not in flower - can't even be called Michaelmas daisies this year. Annie, thanks for the comment. These aster were actually cut back, twice, once around Memorial Day and again around 4th of July. Whoa - you guys did get a lot of rain, didn't you! I love the brilliant color of the aster and they comliment all the orange pumpkins in the garden because their centre is orange! I also love my asters. This year I have two new one, they are comming by the wind! Pale lilac!